I just lost my best friend about a week ago. His name was Lazarito. 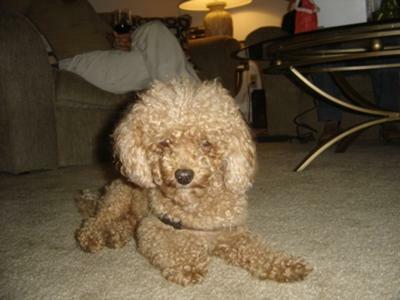 He was a 14 year old Toy Poodle. I had him since he was 4 weeks old. He was my 4 legged baby, my best friend. We've had so many happy years together, nothing else can quite replace him. I miss him with all my heart. Tthe wonderful memories of him will be with me always. Love you baby boy!!! Comments for Lazarito...My Baby Boy! Thank you for your comment. It helps to know other people know what it is like to lose a friend you love and miss so much. I just lost my baby of 15 years yesterday. He was a Jack Russell Terrier named Bodie, but we always called him Baby. My husband said it best right after we got home from the vet, "Baby's main purpose in life was protecting mommie. When he couldn't do that anymore, he knew it was time." That was so true. I hope these words help in some way. I can tell for sure he was a special dog. I am with you in this moment.